Since last Friday when the news came out that Michael Vick's birthday party ended with a shooting, speculation has run ramped about what happened that evening. Today, Vick and his attorney, Larry Woodward spoke with Virginia Beach detectives to answer some of their questions that arose from the shooting. A shooting, which took place in the early hours of Friday morning outside club Guadalajara [wher Vick held his 30th birthday party]. Virginia Beach police spokesman Adam Bernstein discussed multiple topics. One topic of particular interest was Vick answering the Virginia Beach homicide detective’s questions [homicide detectives are often assigned to shooting cases so no need for fans to freak out]. "The case in still being investigated. The case is currently assigned to a homicide detective. Over the last several days, numerous people have been interviewed by detectives. This afternoon, Michael Vick, along with his attorney, came to Virginia Beach Police Headquarters to speak with detectives. He answered the detectives' questions. Bernstein continued to say the identity of the shooter is still unknown, no arrests have been made and if anyone has any information to call 1-888-LOCK-U-UP. In addition, former teammate and Atlanta Falcons wide receiver Roddy White, who attended the birthday bash, said that Vick was no longer at the club at the time of Qaunis Phillips shooting. Fortunately for Phillips, he was treated for a gunshot wound to the leg and was released over the weekend. Finally, Woodward told The Norfolk Virginian-Pilot that one guest was kicked out of the club since he was not invited just before the shooting. This is good news for Vick if Woodward is telling the truth. Vick is still on probation and according to court orders is not allowed to be associated with known felons, so Phillips could have been the man thrown out of the party. Still, this situation is not good for Vick if he expects to be counted on as a backup or even a starting quarterback. This shows a lack of judgment, which my keep some potential suitors away when he becomes a free agent at the end of the 2010 season. Furthermore, for a guy that is supposed to be on his best behavior, he should not be having a party at a nightclub or putting himself into potential danger. According to ESPN's Adam Schefter, Vick will talk with NFL commissioner Roger Goodell and he probably will not have the same type of punishment [if any] that Steelers quarterback Ben Roethlisberger is currently serving [six game suspension]. However, it is unknown what exactly the Eagles think of the situation and they could look to sign veteran QB Jeff Garcia. With Marlin Jackson lost for the season after rupturing his Achilles tendons during the Eagles' June OTA, the team has decided to pick up undrafted rookie safety Brett Johnson on Monday. Johnson (6-1, 194) signed as an undrafted rookie by the Buffalo Bills following the 2010 NFL draft, but was recently put on waivers. The former California Golden Bear played free safety in college and registered only three interceptions in 49 games. Many scouts and coaches deem Johnson as a rare athlete, but has underachieved and not lived up to his full potential. While Johnson possesses elite athleticism, do not expect him to make the team. The Eagles still have three unsigned rookies [Riley Cooper, Brandon Graham and safety Nate Allen]. This means they are forced to release three players off the current roster to cut down to the MFL mandatory 80-man roster. In all likelihood, Johnson's days are already numbered with the Eagles. On Monday, wide receiver DeSean Jackson kicked off his youth football camp at Moorestown, New Jersey. A issues that was address was his contract situation and if anything has changed. "With the CBA [collective bargaining agreement] it's tough because you have a lot of new players trying to get new deals or whatever it may be. It is a tough situation, we will stick back, be patient and wish for the best," he said. Jackson said he is just working and no contract is imminent. "There has been no progress," Jackson said. "So far I'm looking forward to just working with them and hopefully making something happen get it done though... We are going to do what we have to do to get it done though." Besides his camp, Jackson has had a busy month of June. So far this month he has be on ABC's new reality TV show "Shaq Vs," filmed a promo for NBC's Sunday Night Football and signed EAG Sports based out of Los Angeles to manage his marketing and public relations. However, Jackson was so busy that he did not attend the Eagles’ last voluntary OTA. On the other hand, head coach Andy Reid expects the new rising star to be at training camp and be on time. I want to start off by saying I have no clue rather or not Vick invited Phillips to this party, but I am willing to bet my money he had no clue he was there. Phillips is one of the co-defendants that spoke out against Vick, he is no longer a friend of his, he’s someone that Vick feels turned his back on him. This was a high security, upscale party, in a very good area, that turned ugly. It is a shame that this has happened and Vick has shown that he is more than capable of making idiotic decisions, but from what I can tell this is not one of those similar situations. Vick has fought to rebuild his image, and anybody who followed Vick, knows with the exception of dog fighting, Vick has been pretty clean. No bar fights, no gang relations, no drug dealings (marijuana use he is very guilty of), no rapes. I just hope it is found that his judgement in this case isn’t as bad as it appears to be. VICK DID LET THAT GUY INTO THE PARTY. THE MAN CRASHED THE PARTY!!! A former dogfighting pal of Michael Vick was shot moments after crashing the NFL quarterback’s birthday bash and angrily flinging cake in his face, witnesses told The Post yesterday. Quanis Phillips, a co-defendant in Vick’s dogfighting case, flew into a rage when Vick and brother Marcus Vick told him early Friday to leave the 30th-birthday party at a Virginia Beach nightclub, witnesses said. Vick is barred from associating with Phillips under his parole agreement. Phillips’ brother was at the bash, too, and seemed to be an invited guest, mingling easily with other partygoers. But once Vick and his brother spotted Quanis Phillips, they told him to get lost, witnesses said. Before leaving, Phillips slapped a piece of birthday cake off a female partygoer’s plate, splattering the face of the Philadelphia Eagles quarterback with frosting. “Michael didn’t react. I was surprised,” a witness at the bash said. “But Marcus was the one who reacted. He had this I-can’t-believe-this-just-happened, we’ve-been-disrespected look on his face. He was very agitated.” Phillips left the party screaming and continued hurling obscenities from the parking lot of the Guadalajara nightclub, witnesses said. “Phillips was still yelling, even outside, then five minutes later, a shot rang out in the parking lot,” a witness outside the club said. A Virginia Beach police spokesman said last night that the probe into the shooting was continuing and that no one had been arrested. Phillips, who was sentenced to 21 months in prison for his role in Vick’s infamous Bad News Kennels dogfighting operation, was treated at Sentara Virginia Beach General Hospital before being released. I didn't say he did let him in. i said it is possible that he did, but it looks like Phillips was asked to leave. Also what you have is what is allegedly what happened with Phillips. until the police report is released it is all allegedly not stone cold facts. Also I still question Vick who is supposed to be on his best behavior throwing a party at a nightclub. if I am Vick and I am on a short leash I am not having a party in the town I was arrested in or a party in general at a nightclub. Spend it with your family so none of this could occur. Vick is part of the No Fun League he needs to recognize this more than anybody if he wants to build up a little cash again before they kick him to the curb. I Question your thinking man. Gone is gone, If you want to make theories here is mine. Quantis Phillips Crashed the party and was asked to leave he would not. So vick and his people got him out of there. quantis probanly made a scene about vick leaving that he caused a ruckus and a fight broke out and the shooting occured. How am I a Vick hater? I wrote multiple stories this summer about how instrumental he is to the Eagles offense. I was happy to have him on the team and what he could bring to the table. It is clear that some of you will allow him to do whatever he wants and get away with it. Facts are facts, he was on probation and was asked to keep a low profile and he could not do it. Sorry, folks that is the truth. "Was q invited probaly but he got so wasted he couldn't controll himself an was asked to leave. Believe me q was invited if nt he would hav never got in his brother was there. 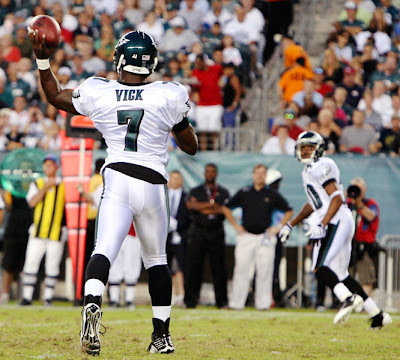 This isn't the first time these two have been around each other"
That is another problem with Vick in this whole thing. It was against Vick's probation to be hanging out with ex-cons and any of the co-defendants in the dog fighting case. He was supposed to be a changed man on a new path in life yet he is still hanging around with people that he was told by the US gov't, the NFL and Dungy not to be hanging out with. I wanted Vick to succeed. I thought he could do it and he could become a great asset to the eagles and become a voice against animal cruelty. With this whole situation (if you are correct about him inviting Phillips to the party and other occasions to hang out), lying to the police and throwing a party at a nightclub and not caring about his probation and thinking he was above the law shows he has not changed his ways.It is sad because he is young and has so much talent, but it appears as if he is more concerned about not getting caught than staying out of trouble. I am hoping it comes out that he is telling the truth and he did nothing. However, this incident even if he is innocent will hurt his imagine even more and likely lead to a suspension and possible release from the Eagles. Good for everyone who believed in him and gave him another chance, they deserve to feel like the Falcons did. SCREWED! This is who he is and has always been.